Which Hindu God is “The Best”? This is an excerpt from the first draft of the third chapter of my manuscript summary study of Madhurya Kadambini by Srila Vishnvanatha Chakravarti Thakur. It is crucial to carefully understand the relationship between Vishnu and all the gods, headed by Shiva, so that one fully respects both and offends neither. It helps greatly to understand the various types of living beings. There are two major super-categories of living beings: independent & dependent. Independent beings are self-causing and self-sustaining. Dependent beings manifest as effects of the independent beings, and rely on their for their sustenance. All forms of Godhead beyond the material creation are independent beings. All other entities in the material world or beyond it are dependent beings. Within the category of independent beings are two subdivisions: those who never come into contact with the material dream-world, and those who do. Shiva is a very special god because he exists outside of the material universe and is therefore independent, yet comes into contact with it and thus is not in the same subdivision of independent beings as are the forms of Godhead who exist purely in the spiritual realm. Although Shiva does contact Maya intimately one should not develop an offensive mentality towards this god, by considering him to be like the other dependent beings trapped in illusion. Shiva contacts illusion as her husband and is therefore free from being bewildered by her, like everyone else who is under her control. Shiva always remains an independent being, like the Supreme Personality of Godhead, despite contacting the material world of illusion. Vishnu maintains the existence of the material universe. Because maintenance is a function of the clear type of material energy – the sattva-guna Vishnu is therefore uncolored, unsullied by his interaction with this world and remains equivalent to the independent forms of Godhead in the spiritual world, known as the Narayana Godheads. Brahma creates the material world. Creation occurs by the reddening type of energy – raja-guna. This energy colors Brahma as well. In some universes the independent Godhead accepts the role of Brahma and is colored and changed by that role. In most universes Brahma’s role is given to a pre-eminently qualified dependent being. This knowledge can cause a misunderstanding: Since the reddening energy (raja-guna) is superior to the darkening energy (tama-guna) does this not mean that the god of the reddening energy, Brahma, is superior in nature to the god of the darkening energy, Shiva? No. Shiva is an independent being, and Brahma is a dependent being. However even in rare cases where the independent Narayana assumes the role of Brahma, Shiva still remains superior to him. Fire is analogous to spirit, the “independent substance.” The clear mode is analogous to fire because by being situated in clarity one can see oneself perfectly and come to self-realization of oneself as a spirit independent from the body and all matter. Thus it is clear that Vishnu, the god of the clear energy, is the supreme among the three. Now, however, let us turn our attention to the other two. Shiva is the god of the darkening energy, which is analogous to wood. Brahma is the god of the reddening energy, analogus to smoke. Fire can be produced from wood, but not from smoke! Smoke is merely a byproduct of fire, but in wood, fire exists in a transformed and potential state. This explains that Shiva is superior to Brahma. The independent Godhead is “fire.” Shiva is a transformation of the independent Godhead, “wood.” Brahma is a byproduct of the independent Godhead, “smoke.” The byproduct of the independent beings are the dependent beings. There are two major categories of dependent beings: those who are covered by ignorance of who they are, and those who are not. All the infinite living things in the material universes besides Vishnu and Shiva fall into this category: all the insects, planets, fish, animals, humans, and even superhuman beings called gods or demigods. The dependent beings who are not ignorant of themselves also have two subcategories: those who are empowered by the independent Godhead and those who are not. Enlightened but not empowered dependent beings have two further subgroups: those who submerged their individual identity within Godhead, and those who retain their individual identity. Those who submerge their identity are unfortunate, because they lose the chance to taste the glory and sweetness of godhead from the position of an observer. Enlightened and empowered dependent beings also have two subclasses: those empowered to help people become liberated from material existence, and those empowered to help manifest the material existence. 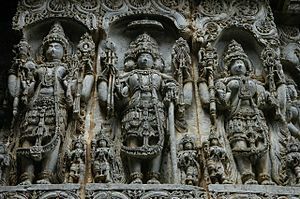 The Four Kumaras and other great teachers are examples of the former, while Brahma is an example of the later. Vishnu and Shiva are essentially the same, since they are both independent beings. It is only because Shiva is in intimate contact with material illusion that is not the most proper object of adoration for those whose goals are beyond material illusion. Vishnu and Brahma, on the other hand, are fundamentally different. Vishnu is an independent being, while Brahma is a dependent being – albeit an enlightened and empowered dependent being. When the purana and other scriptures describe the essential equality of Vishnu and Brahma they are referring to the absolute efficacy of Brahma’s being empowered by Vishnu. When scriptures stress on the necessity of differentiating the superiority of Vishnu over Shiva they refer to the need of recognizing that Shiva is Vishnu in intimate contact with the transforming energy of material illusion. In some cases these statements can be interpreted to refer to expansions, aspects, or functions of Shiva that may sometimes be carried out by dependent beings acting in Shiva’s role as a result of being empowered by the independent Godhead. I will offer my observation that I personally strive to view all eminent beings, including all the demigods up to but not including Shiva entirely as gaining all their power and authority due to their connection with Vishnu, the independent Godhead. Thus I simultaneously respect all these beings by acknowledging their profound connection to divinity, as well as especially respecting the original divinity in the form of Vishnu-tattva and therefore not committing offense towards any of these great personalities. People who have not made the effort to discuss these points carefully will say offensive things like, “Only Vishnu is Godhead, Shiva is not! We only worship Vishnu and will not even look at Shiva!” Or they may say, “Shiva is the only Godhead, not Vishnu! Why should I even look at Vishnu! ?” Bickering like this, their hearts become blocked and clouded with serious offenses towards both gods! How can such people get cleared from this offense? In time, they will come across saints who can explain all the details of the truth about the relative positions of Vishna, Shiva, Brahma and the other gods. Hearing these explanations carefully they can gain a correct understanding. Then, by engaging in Hari-nam Sankirtan with such correct understanding, the effects of their offense quickly disappear. 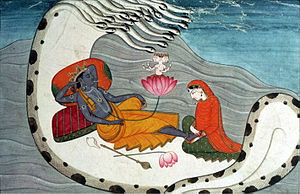 Vishnu is the transcendental Narayana causing the existence to exist. Shiva and Brahma exist within that existence. Vishnu is milk and Shiva is like yoghurt. The two are the same, just that one is in contact with some agent. Shiva is in contact with destructive power. Why should we strip God of beauty and personality and name and form when in fact God is the origin of all such. Form is superior to formlessness, and transcendental, unlimited form is superior to both. Know Sri Narayana to be of transcendental name, form, and qualities – and center your energies and efforts on pleasing him. That alone is truly auspicious. We should not fight among ourself by searching who is the best,as both Shri Vishnu and Mahadev have the same powers.Blessing of both of them give us success wealth and eternal peach.In Treta yog Shree Ram was Shree Visnu’s avatar and Shree Hanuman ji Mahadev’s avatar.Hanuman ji was bhakt of Ram ji,where Ram ji worsiped Mahadev in Rameswarm to win the battle and bring Sita ma back.I think Gods dont fight saying “I am the Greater”why should we? It’s not a “fight” of “who is greater” – I agree. And for most people the point is not particularly important. But for those who are advancing on the paths of yoga – they will be establishing sambandha with their iṣṭa-deva – so they must have the knowledge to seek the perfectly appropriate iṣṭa-deva for their divine aspirations. Therefore śāstra gives us information regarding who is “superior” to whom and in what sense. If we are merely interested in avoiding difficult topics we don’t have to concern ourselves with it. But if we care to understand śāstras thoroughly and appropriately to us as an individual we have to throughly study the śāstra under the guidance of a truly great spiritually realized teacher.